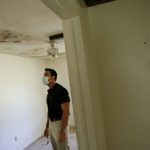 Finding any type of mold inside the house is an off-putting experience, let alone green mold. Not only the color is disgusting, but it also reduces the value of your property. 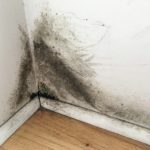 People with already compromised health conditions, especially those with allergy and asthma, can also get affected by large mold infestation. 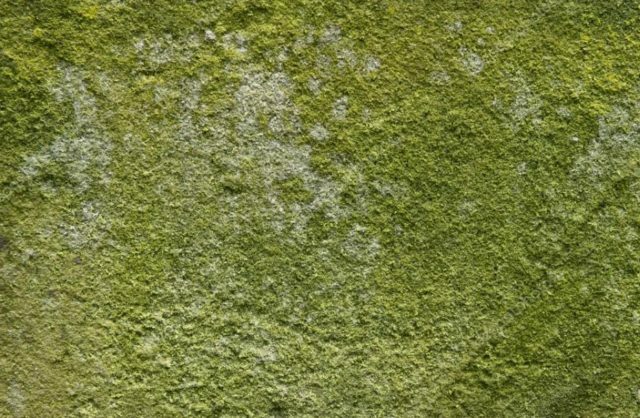 Here are things you must know about green mold and how to remove it. 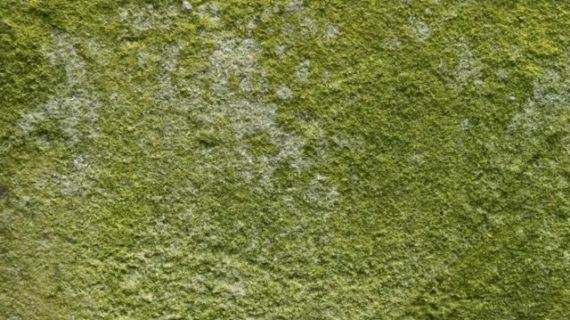 “Green mold” is not a specific name for a single species. 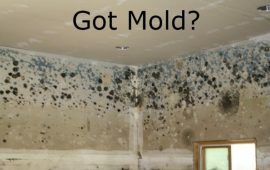 Many types of mold, including house mold, have green or greenish color. Some of the most common mold types that have green color include Aspergillum, Penicillium, and Cladosporium. While they may show green color, they can also appear gray, brown, or yellow. The green mold may first appear as dark spots on certain areas in the house. 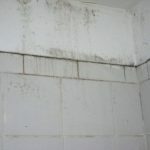 However, if the first signs of mold are not removed immediately, they can develop into a fuzzy layer. If you disturb the surface of the green mold, especially the darker one, you will see spores flying. 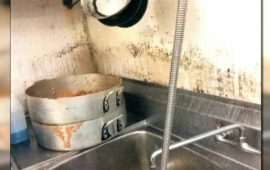 There is also typical musty smell that accompanies the mold. 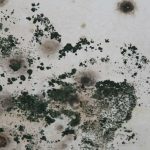 Green mold is an unpleasant sight, and it can reduce the market value of your property. It can also damage various objects, from furniture items to upholstery and old book collections. Healthy people usually can live together with a green mold of light to medium level without problems, but more vulnerable people may develop health concerns. 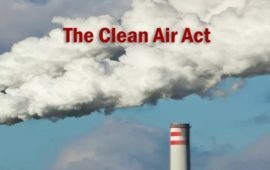 Large-scale mold infestation can release pores that are dangerous for people with allergy, asthma, or chronic respiratory problems. Vulnerable age groups such as babies, children, and elderly people are also at risk. Even staying too long in a house with green mold can cause ailments. Flu-like symptoms such as coughing, sneezing, and runny nose. Eye problems such as redness, itchiness, and teary eyes. Allergic reactions on the skin, such as rashes and itchiness. Be careful if you experience these problems for a long time without clear cause. You may want to start looking at the possibilities of green mold growing in your house. 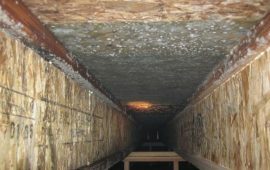 Wood is one of the most common habitats for green mold. The growth can happen if the wood is located in a shaded place, or if it is exposed to moisture for a long time. Green mold or mildew on wood may start as dark spots, and then grow into a fuzzy layer. Green mold on wood may occur on any surfaces, such as wooden fences, walls, window panels, ceiling beams, and floor. If there is leakage or plumbing problem inside a house, mold can grow and even spread to nearby furniture items. A neglected or poorly maintained building usually also shows signs of green mold infestation on the wooden surfaces. The broad surface of walls is an ideal habitat for mold if there is moisture or leakage problem. However, sometimes the problem is not immediately obvious. If you have moisture or plumbing problem inside the wall structure, the green mold may grow inside without you knowing it. Therefore, it can take longer for homeowners to notice mold problem, until the infestation spreads. 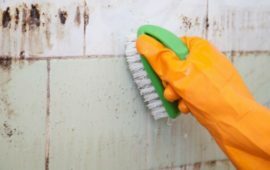 Green mold on walls is usually quite easy to clean, especially if it is still small. However, once the problem spreads, it will come back no matter how much you clean the walls. 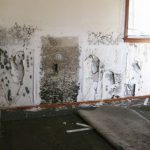 Sometimes, homeowners are forced to completely remodel or renovate the walls to remove the mold problem. Green mold often grows on the surface of bread, even more than other types at home. Bread is an ideal habitat for mold because it has a lot of nutrients. People also generally keep bread in the dark, warm place in the kitchen, creating an even better condition for mold to grow. A few people choose to “eat around” the green mold of their bread, thinking that it is not dangerous as long as they avoid the mold. However, mold can grow deep inside the bread, even if you do not see it from the outside. People with an allergy or compromised immune system can get ill if they eat moldy bread. If you have a serious green mold problem at home, you can use fungicide and vacuum with HEPA filter to clean the moldy parts (HEPA vacuum is used during the cleaning work to prevent spores from flying around). The acidity of vinegar can help removing light mold problem. Mix distilled vinegar with water in spray bottle, and spray the content onto the moldy surface. Let it for about one hour, and wipe the surface with a wet sponge. You can mix hydrogen peroxide (3%) with water in spray bottle, and spray the moldy spot with it. Wait for about ten minutes, and wipe the surface with wet sponge or cloth. Repeat with a dry towel to remove the smallest spores that may be left. However, do not use hydrogen peroxide on fabric or upholstery, since it acts as a bleach on a soft surface. A quarter of baking soda and water in a spray bottle is great to remove green mold. You can spray the solution directly on the mold, and wait for ten minutes. Wipe the mold with a wet sponge, before respraying the spot with baking soda solution. Let the spot dry naturally to remove the rest of the mold. After you clean the mold, throw away all the sponge and cloth you use for cleaning. If the problem comes back even after vigorous cleaning, you should consider calling professional service. Once the mold is removed, apply antifungal paint and make sure to fix all moisture-related problems in the house. 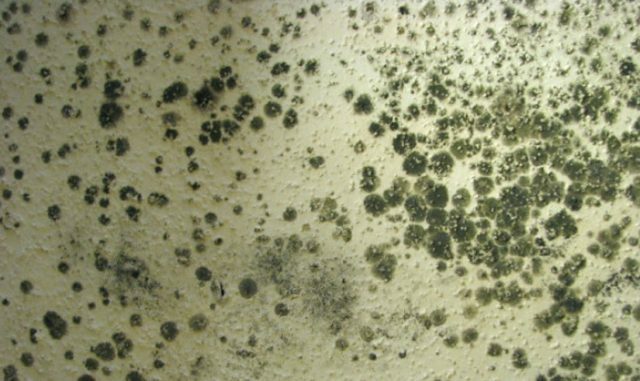 The green mold may be a common problem, but it does not mean you can neglect it. 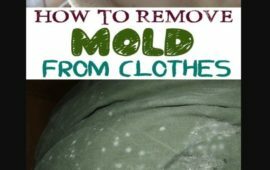 Remove it immediately at the first signs of infestation if possible, and keep the mold at bay by eliminating all the root sources. I am currently renting an apartment where, me and my son are currently living in. I have headaches, dizziness, and inexplicable tiredness. My son who is 5 years old has a sore throat runny nose, and redness of his eyes. 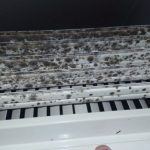 I have mold growth on clothing, shoes, bags, all my son’s toys, important paper work. The mold is growing on my mouse pad in my living room, pillows in my bedroom. Inside my bedroom and my son’s bedroom closets. 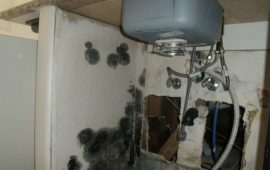 I would like a free consultation on how to take action against my landlord. Taheera, I hope you got out of that house quick!! That is just horrifying!! Some molds will kill you!!! We had a pin-hole sized leak in a pipe, and had a plumber come in and fix it. He did a great job, and used a razor blade to carefully cut a hole in the wall, and sauder new pipes where the leak was. We then talked to our insurance company- who sent in 2 guys to help dry out a 3×3 foot patch of water in our crawlspace. They put in a dehumidifier in- but forgot to put the water outlet outside, or even plug it in- making the machine dump water from the crawl space into our house. They came back the next day, and said that it’ll take longer for it to dry now because of their own mistake. This was going on in 90 degree weather- and the dehumidifier also acts as a heater as well, and we aren’t allowed to open the doors, windows, or use any fans. The 3rd day- I see that there is a bright green substance growing on the 2 wooden- weight-bearing beams beside the pipe. When the 2nd set of contractors had come in- they actually tore off a chunk of the wooden weight bearing beam- using a crowbar to take the wall off- instead of a razor blade for precision and to cause less/ no damage. The dehumidifier is blowing hot air upwards, and my husband said they didn’t dry the water in the wall before they plugged in the dehumidifier. I don’t understand how there could be so many mistakes made. Monday-We had a pin-hole sized leak in a pipe, and had a plumber come in and fix it. He did a great job, and used a razor blade to carefully cut a hole in the wall, and sauder new pipes where the leak was. The 4th day- Thursday- I see that there is a bright green substance growing on the 2 wooden- weight-bearing beams beside the pipe.